Mike is the author of the book Vegetable Gardening for the Average Person: A guide to vegetable gardening for the rest of us. He can be reached at his wesbite: AveragePersonGardening.com where you can sign up for his free newsletter and he will send you a pack of vegetable seeds to get your home vegetable garden started. I love the commercial where they show a heavy set man getting ready to get on the treadmill to do his daily exercise routine. He starts stretching, bending and moving as if he is getting his body ready for the rigorous and sweat filled activity that is to come form the treadmill. So he steps up on the treadmill, pushes some of the blinking red buttons, and the treadmill begins to move. Faster and faster the treadmill goes as does the man who then begins to start running due to the speed of the treadmill. After less than a minute he hits the big shiny stop button and walks over to the scale to weigh himself. When the scale shows that he didn’t lose any weight, the man becomes discouraged. The moral of the story was, don’t look for quick results without putting in the effort. That theme holds true with losing weight which is why that particular company used weight loss as its lead in to prove a point. You need to put the time and effort in if you want to lose those extra pounds. However, what you may not know is that you do not need to spend countless hours in a gym to do it. The key to losing weight is eating right, eating healthy well balanced meals through the day. Studies have shown that eating smaller meals more often keeps your metabolism rate high and that in turn burns more fat. As an avid home vegetable gardener myself I can tell you that growing a vegetable garden at home can serve you two purposes in this area. The first being you can grow the food you need to consume that will help you lose the weight. Each meal you consume throughout the day should have a portion of vegetables included with it. Vegetables provide your body’s requirements for minerals, vitamins and nutrients. When you grow your own vegetables you are guaranteeing their quality. You know what you are using to make them grow, such as water amounts, fertilizers, composts and so on and this allows you to control the amount of harmful pesticides and chemicals. You also save money when you grow your own vegetables. The USDA reported in a recent study that fifty dollars in vegetable seeds can produce as much as two thousand dollars worth of produce. Beyond all that, home vegetable gardening is great physical exercise. The larger the garden, the more work it will require to make it successful. The cultivating of the soil, picking of weeds, watering, digging holes for compost are all physically demanding and work your muscles. I have a garden that is about twenty feet by fourteen feet and I can tell you that I put a lot of work into it that helps me break a nice sweat. Of course standing out in the hot and humid New Jersey weather adds to that as well. I won’t say that you can lose 100 pounds in 30 days, but you can get the extra physical activity you will need to keep your body in motion, and the best part is all of the work you put into it will yield fruits and vegetables that you can add to your daily diet and nutrition program. Mike is the author of the book Vegetable Gardening for the Average Person, as well as the president and CEO of Mike the Gardener Enterprises, LLC. You can, follow him on Twitter as well as join his Facebook fan page. I am a planner. My planning is to the point where it almost drives my family crazy. I need to write everything down and follow a list to get tasks completed. I guess in the back of my mind if I don’t write it down I will forget it, whatever it may be, and never complete whatever I was supposed to complete. I am a big advocate for extending education of home vegetable gardening through reading articles on the subject, buying books or getting them from your local library, listening to podcasts and all of that good stuff. With all of that information in hand there is however one book, one piece of paper, your PDA or iPhone, or whatever you use to do this, that is more important than all of those and that is your garden plan. I believe it is imperative and necessary to keep a garden plan. This will help you keep it organized, know what is planted where, which plants did well in one area so you know what to do the following season and so much more. If you have been keeping up to date on your home vegetable gardening education then you know the importance of plant rotation. Your garden plan written in your gardening journal will help you keep track of what you planted this season so you do not plant the same ones the following year. How you organize your thoughts is up to you. You can put it in diary/journal form with a date then an entry next to that date, you can draw pictures, you can keep it like a goal oriented system where you write down what you are trying to achieve for the upcoming season and then write in whether it was a success or failure, and so on. The process is completely up to you but a very vital part of home vegetable gardening. Now, what can you use as a journal? Again this is completely up to you. I use a binder with loose leaf paper in it so I can add to it as time goes by. When I come across something that I feel is important and can help others I will post it on my blog or website. Many people love the electronic age and through the help of their blackberry’s, iPhones, PDAs and other devices they can keep their home vegetable gardening journals that way. You might be saying to yourself that you have been home vegetable gardening for many years and have never kept a journal and that you have been very successful at it. While all that is true, because my father an avid home vegetable gardener himself, keeping a journal will make you that much more successful. Your journal will give you the ability to keep track of things that worked, that didn’t work, which plants did better in which spot and so much more. Over time, if you don’t write this information down, you will forget. Your home vegetable gardening journal will give you the ability to plan out a successful harvest for an upcoming growing season. If you put the time and effort in to keep this journal, you and your family can reap the benefits for years to come. What does it mean to concentrate? By definition it means to focus in on something and ignore the surroundings. In home vegetable gardening the definition is fairly similar, except we do not ignore anything. Think for a moment the last time you packed for that long vacation to the Caribbean to lay out on the sunny beaches to work on that tan. With all the travel restrictions these days, waiting in long lines at the airport, extra fees for that large red hard suitcase that you have, you make the most of every inch of space in your luggage so you can get through the airport “experience” rather quickly and without extra cost. You stuff the sandals in pockets in your piece of luggage that you never knew existed, and then of course your favorite blue flowered Hawaiian shirt gets rolled up and stuffed into the sandals. In other words you make use of every inch space that you have. Getting back to home vegetable gardening, concentration gardening is similar to packing that suitcase and that is to utilize every inch of space that you have available. Lets’ face it. For most of us that grow home vegetable gardens we do not have the land of Farmer Bob, although some people I know have the blue jean overalls and yellow straw hat, but we’ll save that for another conversation. Because our space is limited and we want to grow lots of vegetables to feed our families, or help out friends, we have to make use of the space we were given. That is why we use concentrated planting in our vegetable gardens. This allows us to use all of the space without sacrificing the amount of vegetables and fruits produced by all of the plants. To utilize the concentrated planting technique you have to plant vegetables that are deep rooted next to ones that are shallow rooted. For example, you can plant tomatoes next to radishes. When you do this you eliminate the space where weeds can grow and that is always a good thing. The soil retains more of its moisture and of course you get more produce. Just make sure that when you do concentrate your plantings that you choose plants that will not compete for space and nutrients. Also, concentrated planting makes it difficult to use tools and machinery to pull out any weeds the garden may have, so those that do grow will need to be pulled by hand. If you have a small area that shouldn’t be a problem, and if your plantings are in a raised bed, it makes the efforts quite easy. Concentration gardening gives us another tool and technique in our repertoire to make the most out of our growing seasons. Here in the Mid-Atlantic region of the country, our growing season starts around mid May and runs through mid October. Albeit a pretty good length of time for a growing season that has varying seasonal temperatures we still need to make the greatest effort to produce an abundant harvest. If you are not using concentration methods in your garden then there is no better time then the present to start. When done correctly you will get more vegetables and fruit and pick fewer weeds and both equal a happy home vegetable gardener. Back when I first started home vegetable gardening, what seems like many many moons ago, I never even heard of intercropping. In fact the first time I even heard the word I thought someone had made it up. So I did some research on the matter and found out that yes it is a real world and intercropping has tremendous benefits for your garden. Traditional home vegetable gardeners just like to plant what they like to eat, in rows that make sense to them, harvest the fruit that they expect, and perform the work (i.e. weeding, watering etc.) they need to do to get their plants to grow. Not many, at least the ones that I have talked to, partake in the activity of intercropping. Intercropping gives you the ability to utilize unused space and do so for more than just more fruit but for a purpose. 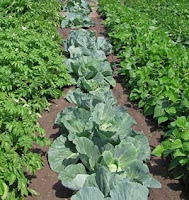 Intercropping is when you grow multiple varieties of vegetation within the same row or area. What this does, is allow you to use the space that would otherwise be left unoccupied or eventually occupied by weeds if you haven’t taken proper measures with a weed barrier. An example of good intercropping would be to plant pole beans along side corn so the beans have a means to grow up without the use of poles, trellises and so on. Now that is more of an aesthetic use, but intercropping offers more of practicality as well. You can eliminate weeds around the slower growing plants like tomatoes and peppers, by planting fast growing plants like radishes or certain varieties of beets. Also intercropping helps utilize a lot of the soil you have available for more vegetation by planting deep rooting plants next shallow rooting plants. The USDA website has a complete list of both of these. When you do this the roots of each plant are not fighting for soil space and nutrients and exist on their own planes in the ground. For reasons that scientists have not yet discovered, there are certain plants that actually help other plants fight off diseases and insects. This topic goes beyond the scope of this article, but many professional organic gardeners have found that when you plant certain varieties of herbs next to particular species of vegetable plants, there is reduction in the amount of crop disease and insect attacks. One such example is when you plant dill in between squash and some other broadleaf vegetables; it has shown to deter many invasive insects. One word of caution when you start with intercropping (and of course you should), and that is when you are removing vegetation that has matured, take precautionary steps so that you do not disturb the underlying layer of roots of the plant that will remain. Intercropping is an excellent technique; some even call it a tool, in a home vegetable gardener’s arsenal of options to get the most fruits and the greatest abundance of harvest in minimal spaces. If you are not using intercropping techniques in your own home vegetable garden then you definitely should. And if you use raised beds due to lack of space on your property then you definitely want to do some intercropping. There will come a time when you do everything right for your vegetable garden, family, pets, kids and so on, to make sure you are going as “organic” as possible, only to have something out of your control happen. I lead with this because it happened to me just yesterday. I have a good amount of grass to grow as do all my neighbors. I took the time to change my mower blade to a mulching blade so I would not have to bag the clippings and can actually have them serve a purpose and that is to provide nutrients to the lawn as they decay as well as provide food for the ecosystem in the soil. It is a win-win situation for everybody or should I say everybody and everything. So I am sitting at my kitchen table yesterday afternoon, I like out the window and notice that the lawn service for my neighbor shows up. I just figured they were there to cut, edge, trim and all of that good stuff, but instead they rolled out a huge hose and started spraying some kind chemical all over their lawn. When I questioned them about it, they said it was to keep mosquitoes and other insects at “bay”. Now granted I have lived in my house for over seven years and I can tell you I have never had any problems with insects and I have never used any chemicals to treat my lawn. So this raises the big organic or non-organic debate that goes round and round. My neighbor pays for a service to dump some chemical on the lawn that “kills” things. Sure they say only insects, but it is created for the sole purpose of “killing” something. How much of that chemical is needed to kill larger living things, like say rabbits, birds, or even Fido the family pet. They will say it is safe because they use it, but I doubt that they even know what’s in it. My point is this. 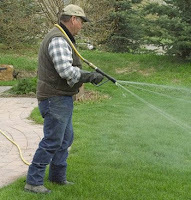 Here you have my neighbor who pays to have chemicals sprayed on his lawn to keep bugs in check. 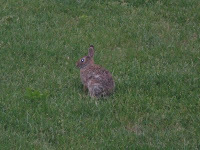 Yet just a mere twenty feet from him is me and I use nothing on my lawn and have no problems with any kinds of insects. Maybe because I don’t put down something harmful that keeps the birds away which hunt the insects and eats them. I have been using organic style methods on my lawn for a number of years and my grass is stronger, thicker, greener and more healthier than it has ever been and here is the best part, it actually has saved me time, effort and money in the process. I don’t have to pay someone to drop chemicals to make my lawn look good and I don’t have bag up my grass to be put in a landfill. Everytime I cut my grass it’s like fertilizing it naturally. You could say it is like taking care of two tasks at the same time. When next year rolls around and my neighbor needs his grass to turn green he will call upon his trusty lawn service and pay them the fee they charge which I am sure is a lot, while I will sit back watch my green grass grow for the mere cost it takes to run the lawn mower. When I started vegetable gardening I was a mere seven years old. I would go out and help my dad turn the soil over, plants some seeds, even bury the food waste in the backyard. Of course back then burying food waste was an oddity in society, whereas today it is not only accepted but encouraged. I will get to more on that in a moment. From the moment I was a young child up until today I learned quickly that there are certain tools I just could not live without to help with the tasks of cultivating my home vegetable garden. These tools make it easier to aerate the soil, mix in compost and other materials, and break up the bigger chunks of dirt. Let me start with my trusty shovel or spade. My shovel is as basic as it gets. It is a simple shovel with a wooden handle and the spade is made of forged steel. You can buy one similar at any home or garden center, although they probably are made with fiberglass handles today. My shovel allows me to dig deep holes to bury my food waste. I will dig a hole about eighteen inches, dump the food waste in and cover the hole with the dirt. I build up great nutrients in my soil this way and my shovel allows me to get to that depth fairly easily. Why this depth? Because that is where the worms live! The next tool in my arsenal is the rake. I use a steel rake with strong tines on it. It, too, has a wooden handle but I also own another one that has the fiber glass variety. Someone gave it to me a while back, so I keep it in the shed. My rake gives me the ability to level off the soil after I have dug holes with the shovel. See the paragraph above as to why I would need to do this. My rake keeps my home vegetable garden from looking like it has hills and valleys, which isn’t good for water drainage. Although raised bed experts might disagree. Finally, what home vegetable garden tool shed would be complete without a pitchfork. A pitchfork looks exactly like how it sounds, like a long fork. They come with either three or four tines. One is not better than the other, but whichever one you do get make sure it is made from forged steel. My pitchfork gives me the ability to turn the soil over without chopping up all of the worms underneath that are working hard to dig tunnels and breakdown the food waste I buried. Because it is made of hard forged steel it is strong enough to break through even the hardest of soils, turn it over and break up clumps of dirt into smaller pieces which I can then use my rake on to smooth out. Many other tools for the home vegetable gardener exist. From small ones to powered ones and everything in between, many varieties exist, but the three I mentioned above, I believe, are must haves for any person’s home vegetable garden. Vegetable Gardening: Help My Squash is being Attacked! I have been growing squash (zucchini variety) for 7 years in my home vegetable gardening. They are easy to grow and the few plants I do have produce a harvest that supplies my entire family as well as being able to give some away to neighbors, friends and family. For the first 6 years of my garden I never had any problems with my squash. That is, up until last year. That is when a species of bug showed up out of nowhere and decided to set up shop on my squash and live in the area which is probably the equivalent of humans living in the middle of a supermarket. My wife was the first to notice the insect on my squash and came into the house to tell me about it. I didn’t think much of it since I never had any issues in previous years. I went out the next day to take a look and low and behold these ugly gray and brown looking bugs were everywhere. Well everywhere on the squash. They had no interest in any of the other vegetation in my garden, only the zucchini. After doing some research I found that the bug in question, the ones on my squash plants, originate from Asia specifically China, although I could not find the exact region. They have been given the name “stink bug” in our area but are also referred to as squash bugs and even called shield bugs. They are part of the hemiptera order. Although the ones I saw in my garden were brown and gray, they can also be green in some parts of the world. They are recognized by their color but more so by the triangular shape “shield” looking backs that they have. 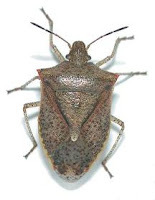 Most stink bugs are plant eaters and are harmless to humans. They reproduce at a very fast rate and are active from the late spring to early fall. Early studies indicate they do not fair well in cooler climates but are quick adapters to the environment and when the temperatures drop will look for ways to get inside warmer areas such as a barn or a person’s home. The bad news is they are resistant to many pesticides which make them hard to control. The good news is you can get rid of them without pesticides but you will have to work at it. Because stink bugs are harmless to humans the best way found to get them out of your garden is to remove them by hand. Put on a good pair of garden gloves and with an empty coffee can in tow, remove the bugs and more importantly all of the egg sacks by hand and put them in the coffee can. When you have removed all of them put the lid on making sure no air can get in. This will suffocate them and they will die. Sure it’s not the most humane way of doing it, but neither is squashing them. A very important note and that is there is a reason these bugs are called stink bugs. That is they emit an odor when they feel they are in danger or threatened. Although the odor they emit is small, it can get onto your skin and be there a while, which is when you are handling them, make sure you where good gloves and a long sleeve shirt. There are home remedies I have read about, none of I which I personally used, so I can not comment on as to whether or not they work. But the best, most organic way, of getting rid of these pesky creatures is to remove them by hand. As long as you stay on top of the situation you will not have a problem, but it does take work. You will see the podcast on the left side near the top. Register for our free newsletter and we will send you seeds for your home vegetable gardening. I know it has been about a week since I updated the podcast with new information, but for good reason. First I am updating the AveragePersonGardening.com website with information, tips, tricks as well as other goodies you will have to come and see for yourself. The new wesbite goes live June 22, 2009. I have also been tending to my own gardn and just recently expanded my vermicompost bin. Actually I built a new one that is even bigger! Woohoo! Also my wife is expecting, so I have been really busy getting the new arrivals room ready, moving my home office and all of the other things that go into making your family larger. So bare with me over these next few days as I try and keep up! Vegetable gardeners were going green long before “green” went main stream. We have been recycling food waste for decades, storing up rain water in barrels to use when the weather runs dry and so many other things. But now that the world has finally caught on with the green movement, it is time to pass along a list of items that many might overlook and consider trash, but really are great to use in the vegetable garden. If you buy your eggs in Styrofoam cartons then you have to switch to the cardboard carton variety. Cardboard egg cartons, besides being able to be recycled with regular cardboard, can be shredded and mixed in your compost bin and also make great plant seed starters. Simply cut small drainage holes in the bottom of each of the twelve cups, fill with potting soil, add your seeds and water. Once they germinate and you see about two inches of growth, cut the carton so that you separate the cups from one another and then plant the entire cup. I can give you two uses for each before you send them to the recycle center. First, rinse the containers out to make sure all the milk residue is gone. Then fill to about an inch from the top with water, put the cap back on and stick the entire container in the freezer. In about a day you will have a nice solid block of ice you can use at your next barbecue to cool down those drinks. When the ice is ready, run some luke warm water on the outside so the ice inside detaches from the plastic sides. Take a utility knife and cut the container in half, in other words separating the top of the container from the bottom. This will allow you to remove the ice. Now take bottom half and drill some holes in the bottom and you have an excellent pot for flowers and plants and the top makes for a great protector against the cold air at night. Before you toss that old hose into the trash, create for yourself your very own soaker hose. Poke plenty of holes in the sides of the hose so that when you turn the water on it drips through the holes you just created. Don’t just toss them into the trash, you can use them to tie up your plants. Tomatoes have weak stems and instead of splurging on the Velcro ties you can cut up some old socks and t-shirts and use them instead. Done reading the paper yet? Is your neighbor? Good! Newspaper makes a great weed barrier and also great mulch for the compost bin. To use as a weed barrier in your garden, lay the newspaper down, cover with grass clippings, and wet it down with your hose. To use in your compost bin, shred the newspaper and just throw it in there. Trash is only trash if you can’t think of anything to do with it. As more people get involved with the green movement, especially those that plant vegetable gardens, we will start finding even more ways to keep our garbage out of landfills. Mike is the author of the book Vegetable Gardening for the Average Person. It is a practical easy to follow book that teaches gardeners everything from composting techniques, aeration and frost conditions, to choosing the right tools and picking the right seeds. Nothing says success as a gardener more than when the first vegetables start sprouting. All of that hard work, from cultivating the soil, adding in compost, and growing your seeds indoors has all finally come to a positive climax. However, it doesn’t have to end there. With the many blogs, message boards and groups on vegetable gardening, why not share your results with other gardeners with some photos. With today’s digital cameras and photo editing software, you can have wonderful pictures uploaded and online in no time. Here are some tips to make sure your shots make your veggies look pristine rather than dumpy. Even though you might have the latest and greatest super zoom camera, I have found that my best photos have come when I move in closer to the vegetable or vegetable plant I am trying to take a picture of. Make sure the plant you are photographing takes up as much space on the view lens as possible. One of the best photo opportunities is when the sun is shining and first thing in the morning. When you see the sun glistening off the morning dew that is on your vegetables, it makes for a great photograph. Next time you take a photo use this shot and you will be happy with it as well. Don’t be afraid to get down on the same level as the vegetable you are trying to photograph. When you take a picture on the same level it makes it look so much better than when you are higher. Nothing looks worse then when I take a photo of something and when I see the picture on my computer it looks terrible because it looks very disorganized. In other words, besides those juicy red tomatoes I was trying to capture, I also got the dog in there, some of the fence, some of my planting pots, and of course that is when my two year old decided he was going to run by. It is best to retake this photo and get it organized so that it will look better. I took the plunge and invested in Adobe Photoshop. It is a great tool for many things I do, and one of those things is editing photos I take. On occasion I will need to remove what I call background noise (unmovable objects, bugs etc) that take away from the beauty of the vegetable I am trying to photograph. There are many photo editing pieces of software on the market and they range in price from as little as $30 all the way up to $500. Buy based on how much you are going to use it. You work hard on your vegetable garden and there is nothing wrong with sharing your hard work with others through photographs. So go ahead and take some good shots of your vegetables and upload them online so others can get inspired by your work. Michael is the author of the book Vegetable Gardening for the Average Person, a practical easy to follow guide for the home vegetable gardener. You can follow him on Twitter as well as join his Facebook Fan Page. Vegetable Gardening: Can I Grow Celery? How do you determine which vegetables you grow in your home garden? I was recently watching a television program about gardening and the host was interviewing a home owner and the vegetable garden they had planted. The host was asking what the homeowner had planted and like clockwork the homeowner pointed out that in row 1 they had this vegetable and in row 2 they had another and so on, and that got me thinking about vegetables that we as home gardeners rarely plant. When I plant my vegetables I, probably like most, plant vegetables that I enjoy eating the most, and completely overlook those vegetables that I eat but not probably as often as the most popular like tomatoes and peppers. I have recently designated one row in my home vegetable garden to those vegetable plants that I eat, although not a lot of, to help reduce the costs I would normally incur on my shopping bill. Celery falls into that category. I do not eat a lot of it, and one single plant gives me plenty for an entire season. Celery is a cooler temperature plant and grows better in temperatures 60 to 90 degrees Fahrenheit. It is recommended that soil they are planted in remain moist at all times, and it usually takes anywhere from 100 to 150 days to fully mature. If you live in an area like me where planting begins around the end of April to early May, you will want to start celery as soon as the fear of frost subsides. Now I won’t actually harvest the celery until the warmer months, which is ok, I just know that I need to make sure that the soil the celery is planted in is moist and receives little sunlight during the day so I make sure I plant it in a shadier area of my garden. If you don’t have a shaded area you can cover leaves with newspaper. You will know it is time to harvest the celery when the stalks look light yellow. When that occurs cut the plant off just above the roots and you are all set. Celery is just one of those vegetables that you might not have thought of when it comes to planting produce that you like to eat. Can you think of some others that you eat yet not a lot of? Remember a seed for a vegetable plant can produce hundreds of dollars worth of product and costs just a few cents per seed. So use your home vegetable garden this season to save a few bucks and plant those rare vegetables that you eat only once in a while. 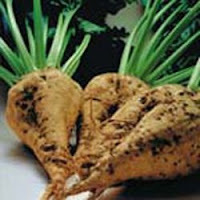 Sugar Beets...and if you sent away for the free seeds this is what they will look like. Vegetable Gardening: The Rabbits Ate My Tomatoes, Now What? Seven years ago I moved into my new home in the suburbs. I lived in a city where the sight of a rabbit was as a rare as Halley’s Comet. In fact in the city in which I lived, pigeons were more of a problem than any other type of animal you could think of. So I started my garden in my new home. A row of beefsteak tomatoes, a row of grape tomatoes, peppers and so on made up my plot of land that I designated to grow my produce. With no experience in protecting my garden from rabbits, once my plants were in the ground I figured I was done so I simply walked away. The next morning I arose to see that both rows of tomatoes (beefsteak and grape) were absolutely decimated. Chewed down to the stem with about an inch of height from the topsoil, the rabbits left near nothing. After doing some research, instead of buying new plants I learned that the tomatoes will return and that they grow like a weed, meaning, that even though they were chewed down to the stem, tomato plants will still grow even though their solar collectors (their leaves) no longer existed. But I also knew that if I did not take any preventative measures the rabbits would be back to finish the job. So here is what I did. First, I outlined my garden with landscaping bricks and set them two bricks high. That alone will not keep the rabbits out so I also added a fence. I use poultry fence which is available at any home center. Sixteen inches of height is all you will need for rabbits (at least in my area). I attached the fencing to some pieces of cedar wood that acted as fence posts, which holds the poultry fence in place. If you are unfamiliar with poultry fence, it is very wobbly, “bendy” you could say, so you will need to attach it to something in order to stabilize it. I used J-T50 staples to attach it to my posts. They are also available at any home center. The bottom of the fence sits about an inch to two inches lower than the top layer of brick. I am not sure if rabbits can squeeze in, but I did not want to take any chances. The bricks were the most expensive at about two dollars per brick, and the fence was thirteen dollars for a fifty foot roll. I found the wood on Craigslist for free, so other than the cost of gas to drive a couple of miles to go get it, that part was free, and I already had the staples from a pervious project. So the cost to secure my garden from rabbits was nominal at best. If you are having issues with rabbits give these solutions a try. It is a cost effective solution without having to spray any chemicals that are developed to “deter” rabbits. Also make sure you buy poultry fencing and not the “so called” rabbit fence. The rabbits can and have gotten through the “rabbit proof” fence in my area in the gardens that belonged to some of my neighbors. Coming Soon my own Radio show! Designed specificallyt to answer questions for the home vegetable gardener! You have put a lot of hard work into your vegetable garden and the fruits of your labor, the composting, watering, nurturing, should not go without reward. Sure you are going to enjoy the many benefits of healthy vegetables grown right in your backyard (or on your porch), but you can also earn some extra spending cash with them as well. I have put together this small list of ideas and venues where you can give selling your delicious fruits and vegetables a try. Who knows you might even make enough to pay off a lot of bills or take a great vacation getaway. Is your local school or place of worship having an event to raise some money like a craft fair, science fair and so on? Chances are you can rent a table from them for as little as $10. Bring in your fruits and vegetables to sell at a price far more affordable then the competition and you can walk away with some extra cash and you will be helping out your community by supporting a good cause. You can always have a yard sale to unload any extra stuff around the house and while you are doing that you can set up a table with your fruits and vegetables on it with a sign that reads, “Grown right here in my backyard”. People can walk away with that old Jack Lalane juicer for $5 and a couple of summer squash for a couple more dollars. It is a win-win situation for you. In southern central New Jersey we have a huge flea market called Columbus. Every Sunday over a thousand people will visit and shop. 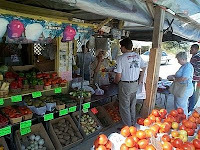 For as little as $15 you can rent some table space and set up your own garden vegetable stand and sell your products. If you are prices fair and right you should have no problems selling everything you have and fairly quickly given the size of the customer base. Check for flea markets like this in your area. They have already done the leg work to bring in the customers, now all you have to do is bring in your vegetables. Most chain stores buy from distributors, but here in NJ when the fruits and vegetables are in season, they will buy from local farms. Now you may not grow enough to outfit an entire chain of supermarkets, but you probably grow enough to outfit the one closest to your house. Give the store owner or manager a call. Make a good deal so you are selling all of your vegetables in bulk, therefore at a lower cost. I will tell you that most nationwide chains probably won’t buy them from you, but, the local “mom & pop” stores will since you are giving them a great deal. Vegetable gardening is such a great hobby. You can grow food for your family and with enough perseverance you also grow food for profit. Learn a few ways to save money on composting, watering and seeds, and your veggies will be even more profitable for you. Vegetable Gardening: Is there a right time to water the garden? It is Monday morning and it is raining cats and dogs. You think to yourself that the buckets of water that are falling out of the sky are a good thing. Good because your vegetable garden really does need a good watering. So you grab your hot cup of coffee, stair out the window and watch as much needed rain falls onto your plants that you are hoping will produce a lot of vegetables. Later that week, Thursday rolls around faster than a cherry red Corvette on a straight away leading you to wonder where did the go? You check you calendar and have marked on there that it is time to water the vegetable garden. Instead, you choose not to because, after all, on Monday the rain was tremendous. This scenario is the trap that we as gardeners can fall into if we are not careful, and that is not watering the plants enough. Many studies have shown that vegetable plants, especially those still in their infancy, need plenty of water. If you tend to only water once per week or water for short period of times throughout the week, then you are doing a disservice to your home vegetable garden. All is not lost though as it is easily fixable. If you don’t own one already, invest in a soaker hose. You can get them for around thirteen dollars at Wal-mart. Just look in their gardening section. A soaker hose looks like a regular hose except there is not end to attach a spray nozzle onto. Instead the water seeps through pores in the house at a slow rate which allows for better watering. 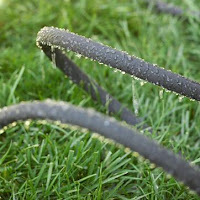 Simply attach your soaker hose to your water source like you would any other hose, and the situate the hose up and down rows throughout your garden. The soaker hose accomplishes a couple of things. For starters, because the water is being dispensed at a slower rate, this allows for the water to drain better through the top layer of soil. Secondly, as many experts agree, it keeps the water off the foliage of the plants and directs more to where it is needed and that is at the root level. Finally water first thing in the morning for 30 to 45 minutes every 4 days or if you are in a climate where it is hot and humid, then for every 3 days. More importantly do not let your plants, especially the young ones, go very long without water. It could stunt their growth and potentially kill them. Follow these tips on watering above to make sure you are doing it right. Watering is not as complicated as some make it out to be, but when done wrong it could limit the production of their gardens. Mike is the author of the book Vegetable Gardening for the Average Person. It is a practical easy to follow book that teaches gardeners everything from composting techniques, aeration and frost conditions, to choosing the right tools and picking the right seeds. You can, follow him on Twitter as well as join his Facebook fan page. Home vegetable gardeners can now connect on Facebook at our new Facebook fan page. Located at: http://www.facebook.com/home.php#/pages/Vegetable-Gardening/88717240962 we can share ideas, tips, tricks and techniques for successful home vegetable gardens. The tomato is an herbaceous plant in the Solanaceae (flowering plants) family. Cousins to the tomato include potatoes, chili peppers, eggplant and tobacco. Yes tobacco. Although tomato plants can be grown as a perennial, it is normally grown in gardens and farms as annuals due to temperate climates. They can grow as high as ten feet but their stems are weak and require some type of stabilizations such as a tomato cage or tying them to a tall stick. The tomato is native to South America with genetic evidence showing that its origins can be traced to the highlands of Peru. The earliest traces of the tomato to North America are attributed to William Salmon (1868-1925), who was an American Politician that served in the 7th district of Tennessee as a member of the United States House of Representatives. It is said that he reported seeing them in a southern territory of the United States more commonly referred to today as South Carolina. Although no one is 100% sure how they came about in America, some scientists believe the species found originated somewhere in the Caribbean. Tomatoes love heat and because they do states like Florida and California are top producers in the country due to their longer growing seasons. According to the UN Food & Agriculture Organization, in 2008 the United States produced 111 tons of tomatoes, second only behind China who produced 311 tons, and ahead of 3rd place producer Turkey at 39 tons with a total world production of 125 million tons. There are about 7500 different varieties of tomatoes grown in the world and vary in colors, sizes and shapes. In the United States, gardeners grow ones that are as small as the cherry tomato (1/2 inch in size) and as large as the beefsteak (4 inches in size). Tomatoes are eaten throughout the world and have been shown in studies to aid in a healthier heart. They contain the bright red organic pigment called lycopene. Lycopene has been shown in studies to be a very powerful antioxidant and when you cook tomatoes it makes the lycopene even stronger, even suggesting to assist in preventing prostate cancer. The tomato is enriched with Vitamins A & C, and anthocyanin (blue) another antioxidant thought to be a powerful fight against various diseases. Due to the tomatoes high acidic content, they are easy to can whole, in pieces or in a sauce, because they can be preserved. Though most people think of a tomato as a vegetable, it is a berry which is a subset of the fruit botanical term. Botanically speaking the tomato is the ovary part of the plant therefore it is a fruit. However, because of its high acidity and low sugar content, many do not think of it as a fruit because it is not as sweet as a fruit. The heaviest tomato ever recorded was seven pounds twelve ounces. It was grown by a person named Gordon Graham from Edmond, Oklahoma. Although unconfirmed, the tomato tree growing in the experimental greenhouse in the Walt Disney World Resort, may be the largest tomato plant on record in the world. Finally, what would a tomato article be without at least mentioning the Tomatina Festival? This is the big food fight festival held every year in Spain. Tens of thousands of people will gather in the town of Bunol every year and throw tomatoes at one another. How many tomatoes are used? It is estimated that over 100 metric tons of tomatoes are used every year at the Tomatina Festival. Michael is the author of the book Vegetable Gardening for the Average Person. It is a practical easy to follow book that teaches gardeners everything from composting techniques, aeration and frost conditions, to choosing the right tools and picking the right seeds. You can also follow him on Twitter. In the early spring, the cooler months, that is when I get my spinach, radishes and lettuce in the ground. Within a month or so I have fresh vegetables ready to be harvested. The only problem is once I pick those vegetables it leaves me empty space. Succession cropping is the process by which you plant something new, typically a warmer weather plant, into the area vacated by a cooler weather plant like those mentioned above. When you properly plan out in advance your succession cropping you can easily three crops from the same area. For example, in the spring you plant your lettuce, then the weather warms up, spinach is done so you replace it with squash or tomatoes. As the hot summer months come to a close and it gets cooler again, you can put the spinach back in and get some more. The possibilities are endless in regards to the combination of vegetables that you can plan out. Succession cropping comes particularly useful to those who are limited with space but want lots of fresh vegetables. As you can see you have a variety of options and combinations. If you might be thinking (if you are advanced in your gardening hobby) that you want to plant something in the warmer weather that won’t require similar nutrients as the plant that grew in the cooler months, it is best to visit the United States Department of Agriculture website and look up the nutritional information they may have for a variety of vegetable and fruit species. I have an average sized garden, and I do my best to take advantage of the space I do have. Succession gardening gives me and can give you the added space you need without having to add more space. Combine succession gardening with raised bed gardening and potting containers, and you will see just how many more vegetables you are able to grow in the same space you currently have. Make Sure you are growing your home vegetable garden correctly! New Podcast on Raised Bed Vegetable Gardening is Up! By default gardeners are green, green thumbed that is. They take necessary steps to cultivate their land, regardless of the size, and do the things to make their gardens a success. But did you know you can also do some other things that not only will add to your green thumb but make you go green and be more environmentally friendly? Here are some things as a gardener you can start implementing today for a cleaner environment. Well you are not really recycling water but what you are doing to trapping rain water to be used at a later date so you do not pull more water from the municipal supply. You do this by using a rain barrel, which is just really a fancy word for a container that catches rain water from your down spouts. Just use a garbage can, rubber maid container or something similar and instead of your rain down spouts just going to the ground, redirect them into your containers. When they get full, use the water in your garden. Whether it’s mowing your lawn or tilling the dirt, there are battery powered alternatives to gasoline that can do just as good a job. Today’s lithium batteries are far superior to the ones built just a couple of years ago. They have become lighter, stronger and they last longer meaning longer use in between chargers. Grab yourself a solar powered battery charger (or make one if you are handy) and your power tools will never need gas or the grid. Do you build things for your gardens such as benches, tables and so on? Instead of going to your local home center and buying new, find someone who is giving away old wooden pallets. A simple search in your area on Craigslist or your local newspaper will yield you plenty of results. Then take that wood and your building. From now on buy the eggs that come in the cardboard style egg cartons as opposed to the Styrofoam version. Styrofoam takes hundreds of years to decompose, where as you can use the cardboard cartons as planters for your seedlings, and get his, you can plant the cardboard because it is biodegradable. Now how’s that for going green! You are already a gardener so that makes you an expert at planting right? Did you know by planting trees and shrubs to block out the sun from your house will cool it down in the summertime? Better yet they can block the wind in the wintertime and that will keep your house warmer. Trees take years to grow so it would be best to get started right away. Last but not least, but last for a reason, all good gardeners do the ultimate environmentally friendly technique of composting. This is where you take organic material, such as food waste, leaves, grass, twigs, etc., and let it rot. This is done either by burying it so the ecosystem underneath your soil can do it for you, or in a container called a compost bin. 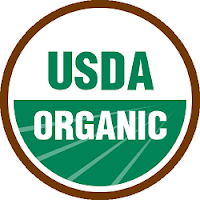 The United States creates over a trillion pounds of organic waste per year that ends up in a landfill. We can reduce 100% of the space if composted our organic material. As you can see none of these ideas will cost you an arm or a leg nor will they cause you to make life altering changes. 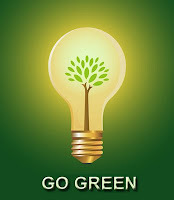 But what they will do is get you closer to being greener by helping the environment. Mike is the co-author of the book Vegetable Gardening for the Average Person. It is a practical easy to follow book that teaches gardeners everything from composting techniques, aeration and frost conditions, to choosing the right tools and picking the right seeds. When is it safe to plant vegetables outdoors? You log on to the USDA website, find the frost map for the United States, look up your zone and low and behold it is time to plant. But wait there’s more! The dates give for the last frost in your area are only a suggestion and the recommendation from most gardeners I talk to is two weeks after that date to avoid that rare case of cold weather that could wipe all of your indoor growth. When should you start fertilizing your vegetable plants? In short, never. Let me explain. Products like miracle grow and others similar to it do work and they work well. But if you really want to build a great garden and one that is chemical free, you need to compost. If you started your seedlings in a potting soil enhanced with products like miracle grow that is fine, but there is really no need to give it anymore than what is required and that is sun and water. Your plants will do fine. What methods can be used to ensure I am getting the most production out of what little space I have? The word of the day is “up” boys and girls and know it well. Many vegetables such as beans and cucumbers can be grown vertically. You can accomplish this by placing a bean pole or narrow yet tall fencing next to these plants and then as they grow you assist by moving them up the structures. Going vertical will save you plenty of square footage in the garden for those plants that need the room. What vegetables can I grow in the fall? Fall is a cooler time of the year so therefore look for vegetables that do better in a cooler climate. Lettuce, radishes, spinach, turnips and various other green vegetables do really well when the temperatures are starting to drop. Visit a local garden center and look for ones that are indigenous to your area and ask the people there. They can assist you in planting the right ones for your area. I have limited space in my condo or apartment and want to grow vegetables from containers or pots. Is that possible? Yes it is very much so. Container gardening has become increasingly popular the last couple of years and the trend looks like it will rise. Regardless of whether a plant is in the ground or a container it needs sun and water so make sure wherever you put your plants you can easily access both. Tomatoes and peppers grow the best but you can try pretty much any type of vegetable, just make sure you use a large enough pot to satisfy the root growth. A pot no less than ten inches should suffice, however you can go as low as six inches for herbs. How hot does it have to be for my tomatoes to produce fruit? Studies indicate that steady temperatures at or above seventy-five degrees Fahrenheit work best for tomatoes. The same studies also showed that it was the temperature that aided in ripening the tomatoes and not the direct sunlight. Mike is the author of the book Vegetable Gardening for the Average Person. It is a practical easy to follow book that teaches gardeners everything from composting techniques, aeration and frost conditions, to choosing the right tools and picking the right seeds. You can follow him on Twitter. Depression is an illness that causes a person to feel they are inadequate. It affects their minds, their bodies, moods and thoughts. Depression affects how one feels about themselves as well as other things. Those who are affected by depression can not merely just think themselves out of it. Depress as a real disease with real problems. If not treated properly depression can last for weeks, months or even years. Depression is a bit harder to diagnose because the symptoms are those that occur in some who may not suffer from depression at all. Some symptoms include, loss of appetite, overeating, constantly sad, anxious, a sense of helplessness or feeling worthless, low energy, fatigue, insomnia and trouble concentrating or remembering things. Although you should always see your doctor first to obtain proper treatment, studies have shown that eating a wide variety of vegetables can help. Vegetables are a great source for vitamins and minerals. Minerals have been shown in studies to be a key source for brain and nerve functionality. In order for your body to be healthy and get the minerals and nutrients it needs you need to ingest high quality vegetables at least 3 times per day, but some doctors even recommend up to 6 times. Good choices for high quality nutrient rich vegetables are spinach, asparagus, and broccoli, to name a few. Not only are they rich in the minerals and nutrients your bodies need but they have an extremely low caloric count, so they are a good source for a healthy nutrition plan as well. Because depression is a disease that affects people mentally and because minerals have been shown to increase brain functionality, many experts believe that eating more vegetables can assist with doctor’s recommended prescription treatments. Unlike other processed foods and meats, vegetables are one of those food sources that we can actually make ourselves (unless of course you herd of cattle in your yard). Through gardening during the warmer months we can literally grow our own treatment for depression in our backyards. Just remember raw vegetables have a higher nutrient and mineral content than cooked, so eat them fresh whenever possible. Try to make half of each of your meals some kind of vegetable to ensure you are getting ample amounts of nutrients and minerals. As a rule of thumb starchy vegetables are ones grown underground (potatoes, carrots, beets etc. ), so limit your intake of those to keep your carbohydrates to a minimum. Eating vegetables won’t cure depression, but a higher intake combined with your doctor’s recommended treatment prescription can go a long way to making depression a lot easier to handle. I have been vegetable gardening for a very long time. In that time I have come across a lot of things I should have been doing, and many things I should not have been doing. For example on the “do not” front, I should have stayed away from chemical fertilizers. Chemical fertilizers (some not all) might assist your vegetables in the short term, but in the long run they will actually harm your soil. Your soil is a living ecosystem with bacteria, enzymes, worms, other insects and fungi. They all work in the food chain to improve your soil’s conditions. For example, bacteria feed on decomposing organic material, and then worms feed off the bacteria. Think of it as the whole “circle of life” thing going on beneath your feet. Here are some things you can do to start improving your soil conditions. Compost is the result of organic material breaking down. It breaks down through bacteria and other microscopic creatures feeding off of it. 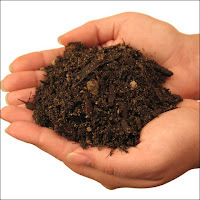 The end result is dark black rich mulch that contains valuable nutrients and minerals that your soil needs. You can use grass, leaves, twigs, food scraps and even cotton clothing (with metal and plastic removed) as a source for compost. Once it turns into the black mulch mix it in with your soil with a rake or pitch fork. Chemical fertilizers help in the short run but harm in the long run. They can wipe out colonies of microscopic organisms in the soil and also send creatures such as worms and nematodes packing for a better place to live. Your soil needs these creatures in order to improve its conditions. If you remove them with these chemicals you may never get them back. When done properly, nature can provide your soil with everything it needs. Many experts say that tilling too much could actually damage your soil, the only problem is they never define what “too much” means. Larger worms in your soil such as night crawlers are deep burrowing and create large tunnels which allow for better water drainage and better systems for your plants roots to grow into. However, many people do not have overloads of night crawlers in their soil so tilling the land is good practice. What is too much? Who knows, but in my experience turning over the soil once every two and a half to three weeks is good practice. It creates for better drainage and allows more air to get deep into the soil so the ecosystem can flourish. Obviously you must water your plants if you want them to survive but more importantly you want them to get stronger, specifically their roots. In order to do that you do what is called “deep watering” which is a fancy term for watering your garden for a lengthy period of time (45 minutes to an hour). This creates deep pockets of water in the soil that your plants roots need to dig for. The more they dig the stronger the plant. Successful vegetable gardening doesn’t happen in one growing season. It is culmination of many seasons of composting, aerating and building up the ecosystem underneath. The stronger you can make that ecosystem, the harder they will work for you. When this happens you will experience great tasting vegetables and fruit for many years. If you love to plant a vegetable garden every year like me then you know the amount of work that can go into it. With all of that hard work there are some things you can do to lesson the “pain” of gardening and make it more enjoyable which is what it is supposed to be. Here are some tips and advice that you can start following today. If timed perfectly you can take your growing plants from the indoors to the outdoors without much worry. Timed poorly and move them too soon and all of that growth and hard work will be wiped out in a matter of minutes. So what causes this? Bugs? Your Neighbor? No! One of the worse enemies of a gardener, frost! Frost occurs when temperatures go low enough to where overnight dew freezes. This condition will kill your new plants. To avoid this look up frost maps online at the United States Department of Agriculture to find when the first and last frosts occur in your area and then calculate your timing. Compost is organic matter that has decomposed and when mixed with your soil provides many nutrients that your plants will absolutely love. You should be making compost throughout the year and mixing it in with the soil as new batches are completed. You could also buy compost, but where is the fun in that. You should never plant the vegetables in the same location every year. Certain vegetables use more of some nutrients then others and by rotating them (combined with composting) you will never deplete an area of your soil from any one specific nutrient. So if you planted tomatoes in row 1 last year, move them to row 3 this year. Mix it up and your plants will love you for it. In my first garden I planted 6 grape tomato plants. Little did I know that they produced hundreds of tomatoes per each plant! I could not pick nor give them away fast enough. I learned the hard way to know my limits and not plant more than I can handle. Again gardening is supposed to be fun and enjoyable not a fulltime job. Plant only what you need and can pick in a reasonable amount of time and you will be sure not to overwork yourself. Next to oxygen, water is the most important part of any living organism and plants are no different. Yet, even though it is important, most people never give plants the ample amount of water they truly need. You should give your plants a good one hour per week of watering, and I don’t mean nine minutes every day, I mean sixty minutes in a single session. When you water like this, deep pockets of water are created underneath the soil which forces the roots of the plants to reach for them. When they do that the roots become stronger creating a healthier vegetable plant. So there you have it. Five tips for vegetable gardening where you won’t have to alter your lifestyle in order to use. Simply follow these suggestions and gardening can be relaxing, fun, enjoyable and rewarding.